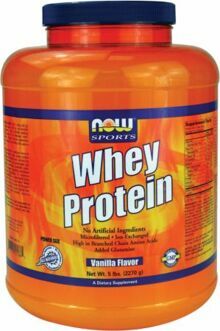 Whey Protein Blend [Ultrafiltered Filtered Whey Protein Concentrate, (including Beta-Lactoglobulin, Alpha-Lactalbumin, Immunoglobulins, And Serum Albumin), Micorfiltered Whey Protein Isolate (including Beta-Lactoglobulin, Alpha-Lactalbumin, Immunoglobulins, And Glycomacro Peptides), And Enzymatically Hydrolyzed Whey Protein Concentrate], Xylitol, Cocoa, Natural Flavors, Betterstevia™ [Organic Stevia Extract (Stevia Rebaudiana) (Leaf)], Free form Glutamine, Soy Lecithin, Xanthan Gum. Add a 1 scoop (42 g) to 8 oz. of cold water or milk and blend. Also consider adding NOW Flax Seed Oil for enhanced nutritional benefit. Please note the additional calories and nutrients provided by the ingredients. Whey Protein Blend [ultrafiltered whey protein concentrate (including B-lactoglobulin, a-lactalbumin, immunoglobulins and serum albumin), microfiltered whey protein isolate (including B-lactoglobulin, a-lactalbmin, immunoglobulins and glycomacro peptides) and enzymatically hydrolyzed whey protein concentrate], natural vanilla flavor, xylitol, xanthan gum, free-form L-glutamine and BetterStevia™ [organic stevia extract (leaf)]. Contains milk and soy. Produced in a GMP facility that processes other ingredients containing these allergens. Suggested Usage: Add 1 level scoop (43 g) daily to 8 oz. of cold water, milk or your favorite juice, and blend. Whey Protein Blend [Ultrafiltered Whey Protein Concentrate (providing beta-lactoglobulin, a-lactalbumin, Immunoglobulins and Serum Albumin), Cross-Flow Microfiltered Whey Protein Isolate (providing beta-lactoglobulin, a-lactalbumin, Immunoglobulins and Glycomacro Peptides) and Enzymatically Hydrolyzed Whey Protein Concentrate], Fructose, Natural Flavors, Xanthan Gum, Free-Form L-Glutamine, Natural Color and Stevia rebaudiana Herbal Extract. Contains milk and soy derivatives. Add 1 scoop (42 g) daily to 8 oz. of cold water, milk, or your favorite juice and blend. Also consider adding NOW Flax Seed Oil for enhanced nutritional benefit. Please note the additional calories and nutrients provided by the ingredients. 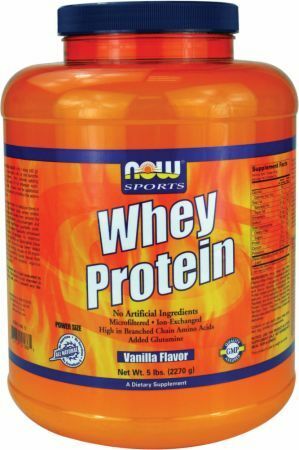 Whey Protein Blend [Ultrafiltered Filtered Whey Protein Concentrate, (including Beta-Lactoglobulin, Alpha-Lactalbumin, Immunoglobulins, And Serum Albumin), Micorfiltered Whey Protein Isolate (including Beta-Lactoglobulin, Alpha-Lactalbumin, Immunoglobulins, And Glycomacro Peptides), And Enzymatically Hydrolyzed Whey Protein Concentrate], Natural Vanilla Flavor, Xylitol, Xanthan Gum, Free form Glutamine, and Betterstevia™ [Organic Stevia Extract (Stevia Rebaudiana) (Leaf)]. Add 1/3 cup (43 g) daily to 8 oz. of cold water, milk, or your favorite juice. Stir or blend. Contains milk and soy. Natural color variation may occur. Use this product as a food supplement only. Do not use for weight reduction. This product is sold by weight not volume.